Located 2.8 km from SeaWorld San Diego 6 km from Old Town San Diego State Historic Park and 6 km from University of San Diego Daves Misssion Beach Retreat offers accommodation situated in San Diego. Guests staying at this apartment have access to a fully equipped kitchen. 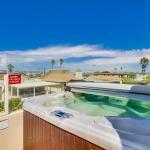 This air-conditioned apartment features 2 bedrooms and a bathroom with a hot tub and a bath. A flat-screen TV with cable channels and a DVD player are provided. Downtown San Diego is 11 km from Daves Misssion Beach Retreat while Balboa Park is 11 km from the property. San Diego International Airport is 7 km away.